A husband and wife from Lebanon were walking into Sunday night's concert by two of Christian music's best-known artists ever, Steve Taylor and Peter Furler. The man took a quick look around the concert venue, and smiled. "It's amazing how many bald heads are here tonight!" he chortled. Many of those heads probably weren't bald back when Taylor, the iconoclastic, energetic, authority-provoking (and prolific) singer-songwriter, and Furler, long-time frontman for the chart-topping band the Newsboys, were staples on Christian radio in the 1980s, 1990s and (in Furler's case) the 2000s. 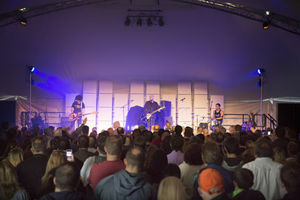 There were indeed some "seasoned" adults among the 450 or so who nearly packed the Junction Center tent, at Christian radio station WJTL-FM, Sunday along Junction Road in East Hempfield Township. But the older guys up on stage, Furler and then headliner Taylor, made them feel young again by rocking the tent with a great, powerful three-hour concert that was a mix of the nostalgic and the new. Taylor, now 56, dressed in a sharp suit and tie (made me, at least, think of Robert Palmer's '80s video for "Addicted to Love") had the energy of a man half his age as he tore through such classic, ground-breaking songs of his as New Wave-era "Meltdown," "We Don't Need No Colour Code" and "Easy Listening," with most of the crowd answering Taylor's "Easy" with "Listening" and "Barry" with "Manilow." Junction Center Sunday night in Manheim. The younger (47) Furler played a rousing hour-long opening set of Newsboys and solo material, then, after a 15-minute intermission, continued his long musical relationship with his friend Taylor by playing the drums for Taylor's own energy-packed 90-minute show. Furler, on guitar for his own set, only had two others in his band, but they were tremendous: Dave Ghazarian (formerly of Superchick and Audio Adrenaline) brought an extremely active, high-treble bass and Jeff Irizarry was Keith Moon-like on drums. "There's only three of us, so we're trying to make as much noise as possible ... none of that pre-recorded-track rubbish," Aussie Furler said with a smile at the start of his show. "We're giving you 100 percent live music, because Pennsylvania deserves it!" Furler's set: "Something Beautiful"; "Million Pieces (Kissin' Your Cares Goodbye)"; early-'90s Newsboys smash "Not Ashamed"; new radio single "Sun and Shield"; a surprise, excellent, number, "Spirits in the Material World" by the Police; "Dare I Say," also from the new "Sun and Shield"; "Reach"; mid-90s Newsboys number "Lost the Plot"; the new "It's All Right" (For Lazarus)"; huge early-90s Newsboys' hit "Shine"; early 2000s hit "He Reigns": and the catchy singalong "I Am Free" ended it in excellent fashion. Furler, always playful in his stage comments, said a young guy told Furler he hadn't even been born when the singer wrote "Not Ashamed" 20-plus years ago. "Shut up, kid, I was 4 when I wrote it, OK?" Furler said he told him, and everyone laughed. 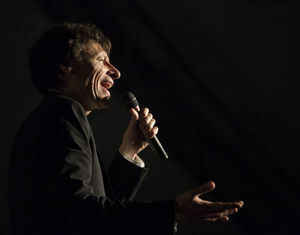 Taylor has had a long association with Furler, having written a slew of Newsboys' songs, from the early "I'm Not Ashamed" to the catchy singalong "Breakfast," which many consider to be one of the best songs ever in Christian music. Taylor also has been an active filmmaker and songwriter for other artists, from the harder-edged Christian band Guardian to the Continentals. "His fingerprints are all over the best of Christian music" through the years, John DiBiase, founder of jesusfreakhideout.com, the influential Christian music website, explained before Sunday's show. "He's been an icon of Christian music for a lot of years. He was on the cutting edge back then, and I'm interested in seeing where he is going to go" with his new music, DiBiase added. It's been more than 20 years since Taylor released his last new album, "Squint," but now he has re-emerged musically with a popular new radio single, "A Life Preserved," and promised his fans Sunday that there will soon be a new album. "We're going to play some new songs for you just to prove that we do have a new album," he joked. Along with Furler on drums, Taylor, who looked a little Steven Tyler-ish with the mike stand, was backed by a top-notch band of his own (Jimmy Abegg on guitar and John Mark Painter on bass). Highlights of Taylor's stint Sunday included a lighter version of "A Life Preserved" than the one on the radio, and Taylor's first concert version of "Meltdown" in, according to the artist, decades. "So if it's a train wreck, I can't think of a nicer place to have a train wreck than in Lancaster," he declared, but the roar of the crowd when "Meltdown" ended told him, this was no train wreck. The crowd Sunday was the largest so far on the Taylor-Furler tour, some on hand said. David O'Connor is a Lancaster Newspapers reporter who covers suburban government, off-the-field news for the Lancaster Barnstormers and general-assignment issues.